Saturday, May 4, 1 p.m. – 2 p.m.
Colonial religion has often been stereotyped by geographic locale. Virginia has often been viewed as a bulwark for the Church of England while New England was the epicenter of the Puritan movement in America. While there are kernels of truth, the contour of religious life in the Old Dominion was far more complicated. The eventual dominance of the English church came only after years of concerted effort to quell religious dissidence. 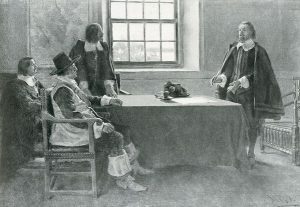 Virginia was home to a considerable of people considered to be part of the Puritan movement. This lecture hopes to highlight an often overlooked populace in Virginia history. I am looking forward to the opportunity to speak on the matter.